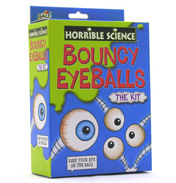 This range of toys and books is based on the massively popular series Horrible Science. 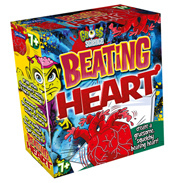 Its creator Nick Arnold wrote the bestselling, 100% horrible, science book series and the books were illustrated by his partner in crime Tony De Saulles. 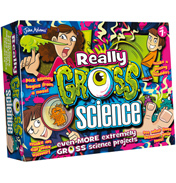 Both have incredible imaginations of the horrid variety and this has resulted in the award winning products which encourage interest with their tales of trivia, the remarkable, gooey, stinky, disgusting and downright unpleasant which is what most children revel in. This means that there is a much greater chance of the science beneath such horribleness sticking in the brain which is very good news for parents and teachers. Nick is not a scientist but he has always indulged in writing horrible stories. He loved science at school but found the classes dull, dull, dull so decided when he was grown up to find out ways of keeping the class, and readers of science books, awake. 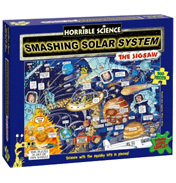 So this is how it started, and from this spawned the series of Horrible Science Kits you find here too. His accomplice artist Tony liked to draw disgusting doodles when he was younger so together they were a match made in heaven. 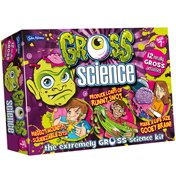 Mr Arnold likes to promote science and learning and his books include ‘Dare you discover’ sections where scientific experiments can be carried out in the home. Indeed he once broke his arm during a demonstration of one, not that the demo was dangerous – he just fell off a table setting up one of his experiments! Duh! To his credit though he carried on in pain so the children weren’t disappointed. 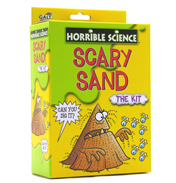 Galt (Living and Learning), the UK toy company, have produced an excellent range of experiment kits to sit along side the book series, which are interesting, exciting and educational and of course many having horribly fantastical experiments to try for active fun at home. Some of which have won amazing awards as well. 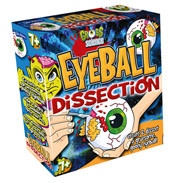 Each kit (or game) comes as a boxed set of science with horrible twists, some of which are guaranteed to turn your stomach and blow your mind! They are clear in their instructions and are easy to do. 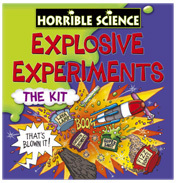 On the Chemistry and Physics side of things look at Explosive Experiments (‘Boom’), Chemical Chaos which is a little chaotic, Violent Volcano (‘It’s a blast’), the Horrible Sciences Shocking Rocket which is a major big seller and ‘out of this world’, and Fatal Forces. Looking towards creatures and animals, Microscopic Monsters lets you discover the hidden creepers and lurking beasties hanging around in your home (yuk), and Slimy Slugs and Beastly Bugs need little explanation. There is of course Nasty Nature, The Kit and Dangerous Dinosaurs can be used to dig up a deadly Dino. Science has just never been this horrible! 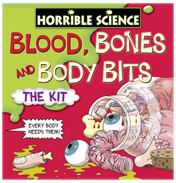 Enjoy Horrible Science in The Kit, The Book and The Jigsaw. 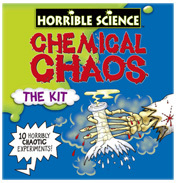 Perfect as gifts for kids so teach Science the Horrible way with a little bit of help from Nick Arnold (well a lot actually! ).